This is a book chapter dealing with drainage systems, effects on agriculture, design criteria and examples in various agro-climatic zones. 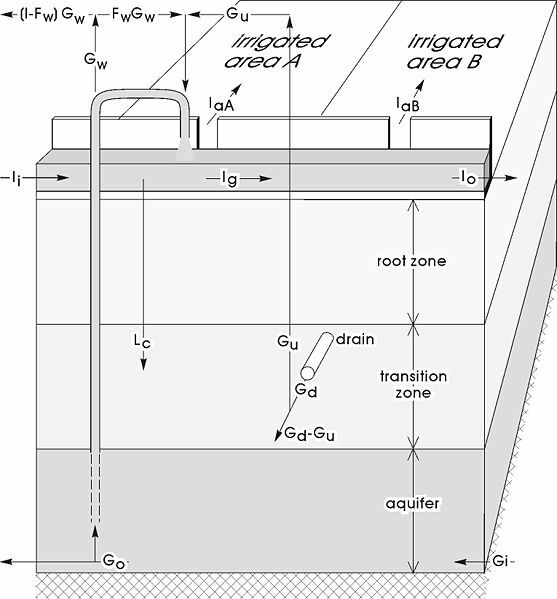 This is an article giving the mathematical theory and examples of groundwater movement and seepage used in the EnDrain program (see Software on this website). This paper can be used as a manual of the WellDrain program (see Software page). This manual gives a description of the Saltmod model (see Software page or below) including its principles, user menu, and case studies. SahysMod is a combination of Saltmod and a mathematical (numerical) groundwater model simulating water flow and salinity in unconfined and semiconfined (leaky) aquifers using a polygonal network with nodal points. the concept of a nonlinear reservoir. does calculations on horizontal subsurface drainage systems in agriculture, hydraulic head, depth and level of water-table in agricultural land, and drain spacing using the energy balance of groundwater flow but also the Darcy and continuity equation (mass balance of water). It includes drain entrance resistance and soil anisotropy of hydraulic conductivity (soil permeability for water), i.e. the horizontal and vertical hydraulic conductivity are different. Applicable to pipe/tile drains (drain pipes) and open ditches. Calculates the spacing of wells, the shape, depth, and level of the watertable in vertical drainage systems using pumped wells. Like EnDrain, it permits aquifers with various different properties and, in addition, fully/partially penetrating wells. a mathematical, numerical simulation model describing the relations between agriculture, crop rotation, irrigation, rainfall, potential and actual evaporation (evapotranspiration), climate, hydrology, depth and level of water-table, capillary rise, deep percolation, soil salinity and subsurface drainage by drains or wells, and reuse (conjunctive use) of ground and drain water from wells. It includes farmers' responses to water logging and soil salinity. A simplified version of SaltMod with the advantage that calculations can be made for shorter time steps (e.g. weekly or monthly). SaltCalc can be used when field observations of irrigation, water table and soil salinity have been made and one wishes to develop a model for that situation. Normally, calibration of unknown values must be done using a range of values of the corresponding variable, running the model repeatedly for a number of time steps, and selecting from the range the value giving model results closest to observed values as the optimal value. This model is somewhat similar to SaltCalc. On the one hand the water management options are fewer (e.g. re-use of drainage or well water for irrigation do not feature here), but the model is more modern in the sense that the variable input for each time step is given in a table so that the calculations over all the time steps are done in one go. Moreover, by inserting the observed values of soil salinity in the data table, the model optimizes the leaching efficiency of the soil. a combination of Saltmod with a model of ground water flow and hydraulics to account for large spatial variation through a network of polygons. It includes phreatic (unconfined) aquifers as well as soil layers with slow vertical hydraulic conductivity (soil permeability for water) resulting in semiconfined (leaky) aquifers. In agriculture, waterlogging means that the soil is considered too wet to cultivate crops profitably (except lowland rice). Waterlogging can be stagnation of water on top of the soil surface and/or the presence of a high water table inside the soil (at a depth of say 0.7 m on average). Surface waterlogging can be seen as a flood control problem or a surface drainage problem. Subsurface waterlogging can be tackled by a subsurface drainage system. As an alternative one may opt for another kind of land use. More information can be found in an article on Drainage Criteria and in a paper on world wide cases of Drainage Systems. Drainage is required when the soil is too wet (waterlogged) for optimium crop growth. Then, the soil needs to be made dryer by drainage. There is a series of reasons why crop growth is hampered in waterlogged conditions. The article on Agricultural Drainage criteria explains some of the mechanisms and gives examples of crop response to waterlogging and yield increase with drainage (chapter 17.4). 2 - What kind of drainage systems are applicable under what conditions? It is difficult to give a generally valid answer to this question, but the paper on surface and subsurface drainage systems gives a summary of practical experiences with different methods under varying agro-climatologic conditions. 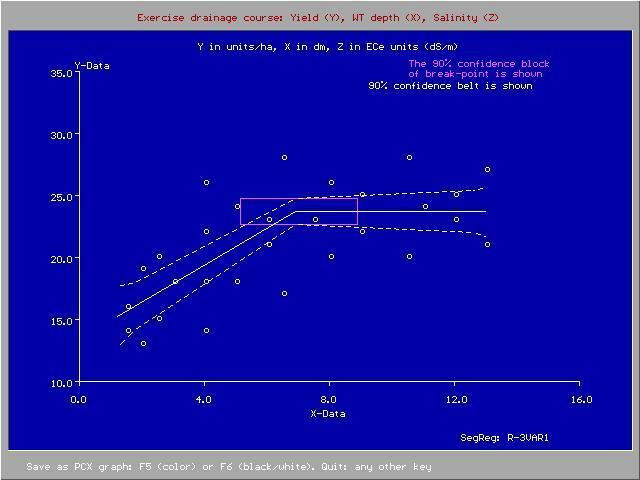 3 - How can I calculate drainage discharge needs and irrigation/leaching requirements for salinity control using water and salt balances without resorting to simulation models like SaltMod and SahysMod? 4 - What is the influence of land slope on the spacing of subsurface drains? The answer is: for drain spacing calculations the slope of the land has little influence. For this purpose, sloping lands may considered as if they were flat. 5 - How can hydraulic conductivity (permeability) of the soil be measured and determined? The measurement of hydraulic conductivity can be done in the laboratory or in the field, above or below the water table, using small scale (auger hole method, infiltration method) and large scale methods (e.g. using drainage data in existing experimental fields or in farm land). A full description is given in the chapter "Measurement of hydraulic conductivity of soils". See also the table of contents on line. For well pumping tests to determine aquifer hydraulic properties see the WellDrain model (software page). 6 - Drain spacing equations for horizontal tile/pipe drains are well known. Can subsurface drainage also be done by (tube)wells and how can the required spacing be calculated? The calculation of well spacings for subsurface drainage can be done with the WellDrain program (see software page). The theory behind it is discussed in the paper Well spacing equations. This is the lecture note on Agricultural Drainage criteria.